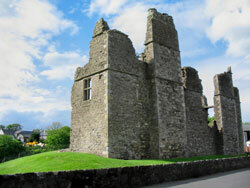 Approximately two miles from Donaghmore village is the neighbouring village of Castlecaulfield formerly known as Ballydonnelly. The most notable landmark is the ruin of the Castle, a Jacobean mansion built by Sir Toby Caulfield and eventually destroyed by fire. In the parish church is the tomb of George Walker, a former rector of Donaghmore, he was the Governor of Derry/Londonderry during the siege and was killed at the Battle of the Boyne; the pulpit from which he preached is now housed in the Orange Hall. According to the 2001 census, Donaghmore electoral ward has a population of 2,106 consisting of 1009 males and 1096 females. The religious breakdown of the ward show there are 1424 of a Roman Catholic background, 259 of a Presbyterian Church in Ireland background, 269 of a Church of Ireland background, 9 of a Methodist background, 30 categorised under Other (including Christian related) and 115 who are of no religion or who have not stated their religion.